I hate that you port KDE apps to Windows. oh come on.. just stfu ... it's a great step from the kde project... and if you say that the windows people who want to use kde programs now don't have any reason to change to linux than think again about it.. there's plasma and the whole solid stuff.. you'll never get the whole KDE4 experience on windows. Great, finally I'll be able to use my favourite apps at school, where all PCs run on Windows. "I hate that you port KDE apps to Windows"
Grow up and see the bigger picture. It's about spreading open access software not forcing a prescribed OS on the user of those tools (ie. like microsoft does). Do you complain when KDE runs on Mac or *BSD? I think it's great news. And I think it will make more people try/use Linux/KDE, not vice verse. I know people who switched to Linux because of certain applications, but I also know many that have switched because they used Firefox, Open Office, Gaim etc. on Windows. "I have my web browser, office suite and IM client here on Window, and Linux has them too." And then they dare to switch, because they know that they still will be able to surf their favorite site (don't laugh; I've actually seen people asking if 'Linux has Internet'), open and write doc files and chat with their friends. And still many hesitate when you mention Linux, because they don't know what awaits them. Amarok2 is also going to be ported to Windows, one of my favorite applications. 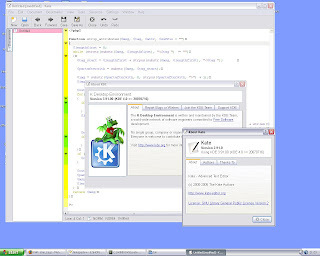 Those KDE-apps will probably make working with Windows much more pleasant. But it still won't be near the experience of using Linux and KDE. At the very least, we should welcome the port to windows (and any other platform) as another means of finding bugs or odd assumptions in development or UI workflow. I think porting application on Windows is a good choice. Because, I think that the main advantage Windows has over Gnu/Linux is the ecosystem of applications. Otherwise, lots of people will already be under Linux (due to all the benefits). Porting applications under windows, permit for lots of people to replace piece by piece the applications they actually used and facilitate the jump to Linux in keeping their datas. REPLACE EXPLORER AS THE DEFAULT SHELL. ..then the rest will follow. follow what? It wouldn't really benefit free software migration (which IS our target). Besides, that's not really possible. Our workspace is pretty Linux/X11 dependent. I really like the second and the last screenshot. How incredibly sneaky of you, Niels. When the software run on Mac, Linux or WINDOWS should not matter. The more people use and recognize that OPEN SOURCE makes awesome and useful software, the better. No one can argue that. And what better place to spread and advertise Open Source? But, on 95% of the worlds desktops (windows) !!! Linux has NOTHING to lose to allow their programs to run on any OS, where as MS does have something to loss. The more open source spreads it self out, the more it will be likely to be recognized and the shift to the Open Source Desktop will soon follow. how can i create a desktop app that runs a window containing linux, i use windows XP? What you are looking for (I think) is a 'virtual machine'. 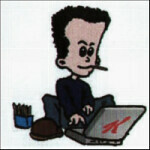 Go to susestudio.com, build your OS like you want it, create a "vmware image" and download that. Then download the free vmware player from www.vmware.com/products/player/ and you can run Linux in a window on windows. The other way around is also possible - running windows in a VM in Linux, of course. Easy to do in openSUSE - go to YaST and look for the VM configuration. Build in!